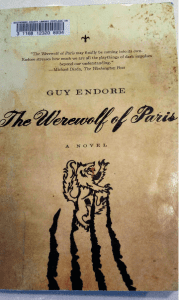 book cover: The Werewolf of Paris by Guy Endore, 1933, mixes politics and horror. My friend J D Chandler is writing a serialized werewolf story inspired by The Werewolf of Paris (by Guy Endore, 1933) but Chandler’s is set in Portland and titled, appropriately, The Werewolf of Portland. J D encouraged me to read the 1933 novel, of which he said Guy Endore was the Bram Stoker of the werewolf genre. He also pointed out Endore’s focus on politics, in France of the late 1800s and by analogy in the USA of 1933. Endore has created a compelling and genuinely chilling psychological novel that leads the reader through the thoughts and feelings, rationalizations and doubts of the many characters that drive the plot to unfold. Meanwhile, Endore gives us numerous exceptional descriptive passages. One example is his metaphor for the way dreams re-emerge into consciousness during waking hours, then just a quickly disappear. This he likens to sunken logs rising from the bottom of a swamp then disappearing again, or more spectacularly, the sight witnessed by some ocean sailors as a long-sunken galleon arose out of the sea, then sank out of sight as if it had never appeared. Endore implies a parallel between the madness of political repression & revenge and the evil of the werewolf—that any one of us might become infected—just as in Eugène Ionesco’s stage play Rhinoceros, and one can even see oblique parallels with Boots Riley’s film Sorry To Bother You. Guy Endore’s pearls of perception are imbedded in some wickedly clever plotting—as neat and precise as a machine—as the story guides us through the psychological contortions of its varied characters.